post breakfast we proceed for the indus valley monastery tour including shey, the ancient capital of ladakh, thiksey an impressive complex rising tier upon tier on a hill above the village and stok palace the present residence of the royal family. enjoy the views at sindhu ghat. overnight at hotel in leh. post breakfast we drive on the Srinagar highway and start our day by visiting the hall of fame - museum constructed by the indian army, gurudwara patthar sahib nestled deep in the himalayas, which was built by the lamas of leh in 1517 to commemorate the visit of guru nanak dev. further we experience the magnetic hill which defies the law of gravity. 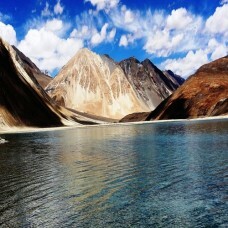 We stop at the confluence of the indus and Zanskar rivers and drive further to Alchi monastery. we drive back to the hotel in leh. After an early breakfast we drive to nubra valley crossing khardung-la-pass - the highest motorable road in the world at 18,380 ft. nubra valley is popularly known as ldorma or the valley of flowers. it is situated to the north of ladakh between the karakoram and ladakh ranges of the himalayas. check in at the resort and later visit the samstaling monastery. enjoy your evening at the campsite. After an early breakfast we leave for pangong lake through the changla pass at 5486 mtrs. pangong lake, situated at 14,000 feet (4,267 m) is a long narrow basin of inland drainage, hardly six to seven kilometer at its widest point and over 130km in length. it is bisected by the international border between india and china. enjoy the landscape in the back drop of the lake. one rarely feels so close to nature and environment and the scenery is unforgettable. evening at leisure and overnight stay at the camp near lake. Morning at leisure to explore the beauty of lake and later we drive back to leh. overnight at hotel in leh. Today we start our journey to leh stopping at sarchu for the night after crossing rohtang pass, keylong and baralacha pass. sarchu is situated at the border of himachal pradesh and jammu & kashmir. upon arrival in sarchu we check in at our tented campsite for overnight stay. Leave for leh by early morning, through nakeela and lachangla pass. lunch at pang. after lunch drive to leh passing through skyangchu thang (biggest and highest plateau on earth on stretch of 42 kms), tanglang la pass and indus valley. upon arrival meet our representative at the hotel. overnight at hotel in leh. After an early breakfast we drive to nubra valley crossing khardung-la-pass - the highest motorable road in the world at 18,380 ft. nubra valley is popularly known as ldorma or the valley of flowers. it is situated to the north of ladakh between the karakoram and ladakh ranges of the himalayas. check in at the resort and later visit the samstaling monastery . enjoy your evening at the campsite. Post breakfast we drive to leh enroute visiting lamayuru monastery. further we drive to leh. upon arrival in leh meet our representative at the hotel. overnight at hotel in leh. Day free for rest. evening visit shanti stupa. overnight at hotel in leh. After your breakfast at the camp, visit the sand dunes to enjoy a camel safari (optional). later we drive to leh over khardung la. afternoon rest and relax or take a walk to the local market. overnight at hotel in leh. Post breakfast we drive to visit phyang gompa, located 6 kms away from leh. further we drive to likir gompa situated atop a windy cliff overlooking the beautiful village of likir. then we drive ahead to reach Alchi - ladakh's most loved monastery. after visiting above monasteries we drive to uleytokpo our destination for overnight stay. Post breakfast we drive further to visit lamayuru monastery and then drive back to leh. overnight at hotel in leh. Post breakfast we drive to tsomoriri enroute stop at chumathang for lunch. This place is famous for medical hot springs. after a short halt drive to tsomoriri, a beautiful mountain bounded expanse of water, situated around 240 kms. from leh in rupsho valley. the lake is located at 14,000 ft. near a small village of korzok. upon arrival we check in at our camp for an overnight stay. Post breakfast we check out from the camp and drive back to leh. reach leh and relax at the hotel. 1. Cost incidental to any change in the itinerary/ stay on account of flight cancellation due to bad weather, ill health, roadblocks and/or any factors beyond our control. 2. The itinerary can be altered at any point of time due to bad weather, ill health, roadblocks and/or any factors beyond our control.